The sixth edition of the TNIE GOAL all- Kerala inter-collegiate football championship trophy was taken home by Nirmala College. MALAPPURAM: The sixth edition of the TNIE GOAL all- Kerala inter-collegiate football championship came to a grand conclusion on Sunday with Nirmala College, Muvattupuzha, taking home the prestigious trophy, etching a 2-0 win over Mar Dionysius College, Pazhanji. A 62nd-minute strike from Vineesh S put Nirmala ahead and Sachin T Sivan netted the winner in the added time of the second half at the Malappuram District Sports Council Stadium. Winners took home Rs 2 lakh while runners-up bagged Rs 1 lakh. The 10 best players in various categories received a TVS Apache RTR series motorcycle each. Handing over the winners’ trophy, Agriculture Minister V S Sunil Kumar said GOAL was the best thing to happen in a district that loves football close to their heart. “I have never heard of a college level football tournament that gives away 10 bikes as the prize. If football lacks inspiration due to lack of money, then TNIE is doing the right thing. The tournament has given a much-needed fillip to the game,” said the minister. Sunil Kumar said more tournaments like GOAL should be launched to give a platform for emerging players. BJP national executive member V Muraleedharan handed over the medals to runners-up. TNIE Editorial Director Prabhu Chawla gave away the trophies to individual award winners while Tarushika Monga, brand manager, TVS Motor Company, handed over keys of bikes to winners. TNIE senior vice-president (sales) Lakshmi Menon and Kerala Football Association secretary P Anilkumar also attended the function. 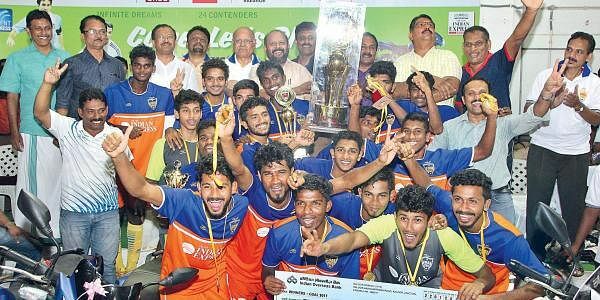 Nirmala College, Muvattupuzha’s long wait to lift TNIE GOAL all-Kerala inter-collegiate football trophy finally came to fruition at the District Sports Council Stadium at Kottappadi in Malappuram Sunday after they downed Mar Dionysius College, Pazhanji 2-0 in the title clash. After a goalless first half, Nirmala College went ahead in the 62nd minute as fullback Vineesh S headed in before they doubled the lead in the second half stoppage time through winger Sachin T Sivan to seal the outcome of an eventful grand finale. 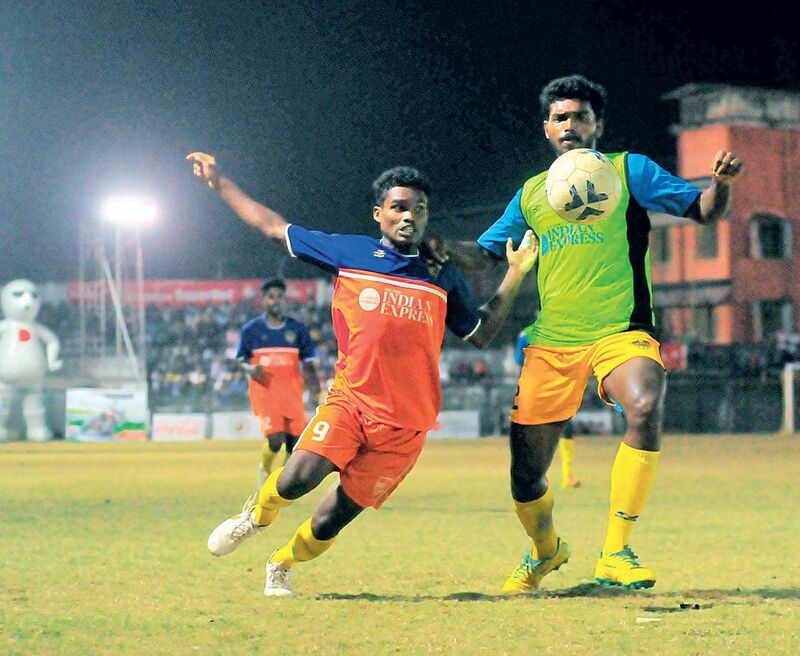 Nirmala College are seasoned campaigners in Kerala’s premier college competition having finished third in the inaugural GOAL in 2012 and ending runners-up in 2013. They reached the last-four again in 2014 and 2016, but will now take home the trophy for the first time. Both the finalists began the match without influential defenders -- suspended Muhammed Haseeb was replaced by Riyaz Mohammed in the MD College starting line-up while Ammanul Khan came in place of injured Vinod J in the Nirmala backline. MD College shed their reputation as a counter-attacking side in the early minutes of the game as they took the game to last year’s semifinalists. Tournament’s joint top scorer Ashique V V came close to giving MD the lead in the 12th minute but his header off a corner went wide. Fayas Asharaf went even closer for MD College and was only denied by the woodwork 10 minutes later as he chested down a throw-in and shot on the turn. However, an injury forced Fayas off the game and he was substituted for Muhammed Ajmalin the 30th minute. With the opponents negating Nirmala’s attacking style of play, they had to wait until the 38th minute to carve out an opening when a Vineesh free kick was flicked on by Sachin to Jithin M whose effort was cleared by the defender. Pazhanji college had a couple of good chances to equalise in the dying minutes of the first half. In the 45th minute, Ashique failed to connect after Ajmal dribbled past the defenders on the right wing and crossed. A minute later, Saneesh V P fired into the side netting. The second half began on a similar note as MD medio Fayas’ shot was cleared off the line by Vineesh. However, against the run of play, it was MD, who went behind, as Nirmala left back Vineesh made it to the opponents’ penalty area and headed in a cross from the right in the 62nd minute. Trailing by a goal, MD went all-out in search of an equaliser. But custodian Abdul Salim maintained Nirmala’s lead in the 72nd minute as he fisted away a shot from Harris P V. Three minutes later, Ibrahimkutty T M failed to latch onto a corner which eluded Nirmala defenders and reached the far post. MD thought they had found a deserving equaliser when Saneesh’s low corner in the 90th minute curled inside the goal. But the assistant referee deemed the ball had not crossed the line before it was cleared by Anandhu S and Sachin put the outcome beyond doubt scoring at the other end on the counter.